A recent reference question led me on an interesting journey discovering more about online family trees. 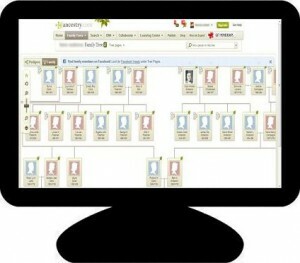 Using a family tree service on the Web has attractive benefits: a centralized location on the Internet to store your family information, the immediacy of sharing by digital means your information with relatives and potential relatives, the thrill of locating new individuals or information to enhance your tree and further your research, not to mention networking opportunities to really thrash out a stubborn brick wall. While it is quite easy to sign up and start adding information to these family tree services, questions about the reliability of the information in any tree will certainly arise for many family historians. Assessing the quality of data represents the beginning of the process. It is through verifying and reviewing the original work referred to in the citation that a researcher can determine the true quality of the source and its citation, and thereby the family tree. Unfortunately, many online family trees are unsourced, and should be considered clues, not facts, until validated with documentary evidence from several sources. After reviewing terms of service statements on several family tree sites, a lingering question I have is what happens to your data when you no longer want to use the service. Only one company, MyHeritage, has a discussion within its privacy statement about deleting a section of a tree, the whole tree, or the entire account. Other companies are premised on the concept of building a single global tree, and so the expectation is that your data remains after you part ways with the company. If I have missed something in reviewing these statements, I would be interested in constructively expanding my knowledge and post a follow-up. Too many people are in too big of a hurry to read the terms of service on most web sites. Once they post a lot of information, they find out they no longer own it or any photos. I find it sad that the owners of web sites are so petty they hide this information in all the fine print. This is the sort of thing that IMHO should be posted at the top of the first page of the web site in big read letters, warning people they lose the right to ownership. Sad to say, it isn’t that way. What I find the most disturbing is people will take what I have posted and put it on their family tree, only to keep it ‘private’ so no one can see what else they have found. To me, they steal the information others work hard to find, and then are not willing to share what they know. Some people just enjoy finding information about their family’s history with no intention of publishing or joining a genealogy group, and do not cite source of information, while others plan to publish or join a genealogy group, and not only cite sources and references, but they list everyone’s children, in-laws, the in-laws family, etc., I have only tracked my direct grandparents, great-grand’s, etc. and their children, no sons-in-law, no daughters-in-law, and all the children and cousins. I have only a few hundred names, while others have as many as 5,000 or 10,000 people listed. In a rush of excitement to locate information, a person can go overboard and end up drowning in information. That is the one thing about genealogy I find interesting: it covers a very wide field of information and interest of those who are searching for their roots. Thank you for the information. What is sad is how much information in peoples trees are wrong. They copy from trees that have no sources.When I correct information in my tree it does not show up in older trees that Ancestry posts .I let people I share my trees with that they are all a work in progress and it is just a hobby not a genealogy society tree.If they notice I have made an error to please let me know so I can correct it. I try to be accurate but it is not always the case.It took me 15 years to finally find the correct surname of my cousin. Her mother married twice and her step father three times. Even her marriage information was wrong. So,I just go on having fun and not getting to serious with my hobby,just do my best at what I do. Have a nice day! I agree wholeheartedly with what both of you have said. About ten years ago, I put both my tree and my husbands online. While doing further research, I noticed some people had just copied my information verbatim. I could tell because I coded the sources in a certain manner and kept a separate list of the source titles. Very few people asked me for the sources. I’m less likely to do a book, these days, other than a simple one to give to my siblings, telling them about what I found. I love the collaborative community on WikiTree.com. We each add our branches, twigs and leaves to the one big WikiTree. If a leaf, called a profile, already lives on the WikiTree for an individual, we must merge any duplicate profiles into the earliest profile ID number. We want one profile per person on the WikiTree. Any WikiTree member can add sources, details, corrections or clarification to improve any of the WikiTree profiles. We all work on the same profiles and family tree branches. I spend most of my time adding sources to profiles that I am not related to and know nothing about except that they need to be improved with reliable, preferably free, documentation such as descendant DNA test information, FindAGrave memorial numbers, census data, and references to on-line books. Please stop by WikiTree.com and see if collaboration is something you might enjoy. It is a great community of researchers! On-line trees should only be used a guidelines to further your own research. Alice is correct in noting that sources should be checked for validity. I share the other responders’ frustration with unsourced trees. If you a posting your information, why not put it all out there for the benefit of others. My personal pet peeve is people who don’t answer posts. I believe genealogy is is to be collaborative. So, if you’ve put a tree up, please be a team player! I got into genealogy primarily because so many of the genealogies done on my family (or portions thereof) were sloppy, inaccurate, unsourced, or all of the above. In fact I have yet to see one that I have any confidence in. Some are so bad they are laughable (or make me grit my teeth!). I was trained as scientist and worked as an environmental analyst, which involves aspects of science review, history, geography, sociology, and other disciplines intertwined to build a multifaceted view, just as genealogy is supposed to do. I am accustomed to justifying every single assumption and every single conclusion I came to. Peer review is a good thing. It is customary to build on others’ work, but it is also required to attribute sources. And collaboration is the norm. So I decided to start from scratch and do my family right, Of course, the first thing I learned is that genealogy standards are as rigorous as those I learned to use. I ended up hooked, and now am in the process of acquiring a solid genealogical education in methodology. I am also learning to sort out the weaknesses of some resources that are not all they think they are. They are still useful for some things, but I will use them judiciously. I do not mind sharing, but prefer to do it one on one, by request, and to make it a collaborative process if possible.